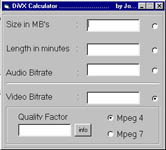 Johnny DivX is a VERY precise bitrate calculator that has a built in quality factor. The latest (11 March 2001) version can now use minutes and seconds and have an increased accuracy. The Quality factor can now be concidered obsolete when using DivX codec with scene change update.